Conservationists had been keeping a close watch on the nearly 50 acres overlooking the St. Croix River valley and the village of Franconia, when TPL stepped in to work with partners in the Metro Conservation Corridors program, which protects natural areas and water quality in the rapidly developing metro region in Chisago County. Conserving the steep and ravines and intermittent stream that drains into the St. Croix River protects the local water quality and viewshed. This 2009 addition to the Franconia Bluff Scientific and Natural Area (SNA) also opens to the public for observing nature and hiking and offers opportunities for scientific research, and educational outreach. 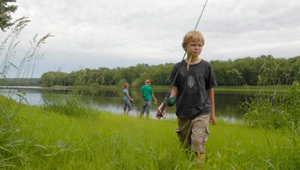 Funding for the purchase of the land was provided by Minnesota's Environment and Natural Resources Trust Fund as recommended by the Legislative-Citizen Commission on Minnesota Resources.